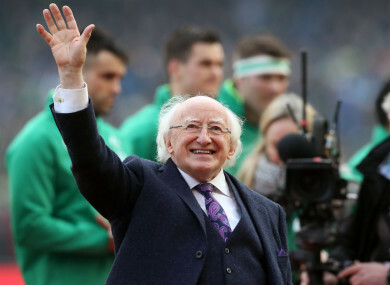 Ireland has overwhelmingly backed Higgins to serve another seven years as president. MICHAEL D HIGGINS will serve a second term as president after being re-elected to Áras an Uachtaráin on the first count. The incumbent president was re-elected with 822,566 first preferences (55.8% of the vote), with the public overwhelmingly backing him to serve another seven years in the post. Higgins fended off competition from five other candidates, including Peter Casey – his closest rival in the race – Liadh Ní Riada, Joan Freeman, Sean Gallagher and Gavin Duffy. A low turnout (43.66%) saw 1,492,338 people vote in the election, with 18,438 of those ballots deemed invalid. The valid poll then was 1,473,900, putting the quota for election at 736,951, a target Higgins smashed on the first count. His 55.8% vote is just marginally behind the biggest winning margin the State has seen – and that was in 1959 when Eamon deValera romped home with 56.3% of the electorate. Casey’s surge to second place came after pre-ballot opinion polls had put his support level as low as 1% just two weeks ago. The result means that Higgins, who was first elected to public office in 1973, will serve a sixth decade as a serving politician. He became the first candidate to be elected as president on the first count in an election featuring more than two candidates. Duffy, meanwhile, received the lowest number of first preference votes (32,198) in a presidential election in the history of the State. Click here for our interactive list of constituencies. Email “Michael D Higgins has been re-elected as President of Ireland with 55.8% of the vote”. Feedback on “Michael D Higgins has been re-elected as President of Ireland with 55.8% of the vote”.